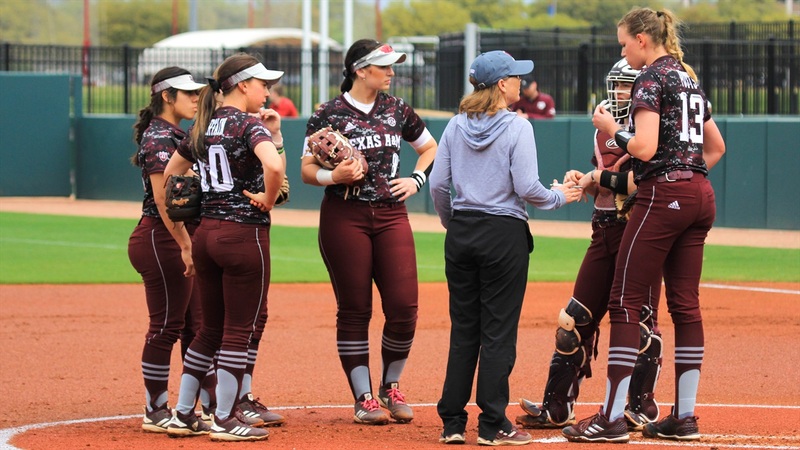 The Texas A&M softball team (17-13, 1-7 SEC) dropped their fifth straight SEC game and their second straight game via run-rule to the undefeated Alabama Crimson Tide (33-0, 5-0 SEC). The Aggies would find themselves in an early hole after two first inning walks and a throwing error by Riley Sartain. Alabama left fielder Merris Schroder took advantage of the A&M mistakes with a subsequent 2 RBI hit to left. The Tide would go on to score a pair of additional unearned runs to give the Tide a 4-0 lead after the top of the first. The Aggies bats were quiet for a majority of the early innings, while Alabama added six more runs in the top half of the third. Aggie starting pitcher Kendall Potts gave up a lead-off home run to Schroder, a bases-loaded walk and a grand slam in the third before being pulled in favor of reliever Payton McBride. Kendall Potts had trouble stopping the red-hot Alabama offense on Saturday. The Aggie would score a run in the fourth inning on an RBI single by McBride, but it would be the only run the Aggies would plate on the day. The Tide added a final run in the fifth inning, and held the Aggies scoreless in the bottom of half of the inning to complete the 11-1 run-rule. Head coach Jo Evans discussed the defeat after the game. The Aggies will look to bounce back Sunday afternoon with the final game of this weekend’s series against the Tide scheduled for 1 p.m. at Davis Diamond. The game will be streamed live on SEC Network+. Poor softball...we used to be so good! We have no pitching,no hitting, and obviously no coaching. of horrendous. They either walk'em or the opponents knock it out of the park. Tear down the outfield fences, give the outfielders a fighting chance. Beat Bama today. Ended their win streak. Well, at least we did not get swept as we won the last game in the seventh 4-3. Yes, we use to be competitive. Is there a connection between our poor performance and signing these long term expensive contracts with a coach? Pay for performance should be the criteria. We just do not recruit very well against other major teams. Why?